I arrived last Thursday evening at the Brooklyn Museum with Jessica Higgins having certain expectations. On a lead from my editor, I thought that I would encounter the quintessential artist organizer himself, Ryszard Wasko, at the opening of the Elizabeth A. Sackler Center for Feminist Art that night. With the idea of seeing Wasko again at the museum openings, and being asked to cover the event for Artist Organized Art, I also knew I would be seeing Judy Chicago’s iconic, large scale project “The Dinner Party,” for the first time. Although I had read the press release about “Global Feminisms,” co-curated by Maura Reilly, the Sackler Center’s curator, and Linda Nochlin, I still anticipated seeing other seminal works of feminist art from the 1970’s onward and was initially disappointed. My preconceptions of what I would see was confronted with an enormously ambitious, unexpected exhibition in the galleries surrounding “The Dinner Party” that places the work being made by younger women, born since 1960, from 50 countries, together for the viewer to assess the present moment of “Feminism(s).” The experience was one of confusion at first, but in retrospect feels like an appropriate take on the female voice which the Feminist Revolution and it’s early activists began to make audible. First things first. “The Dinner Party” absolutely surpassed my expectations. I was astonished by it’s beauty, detail and depth. 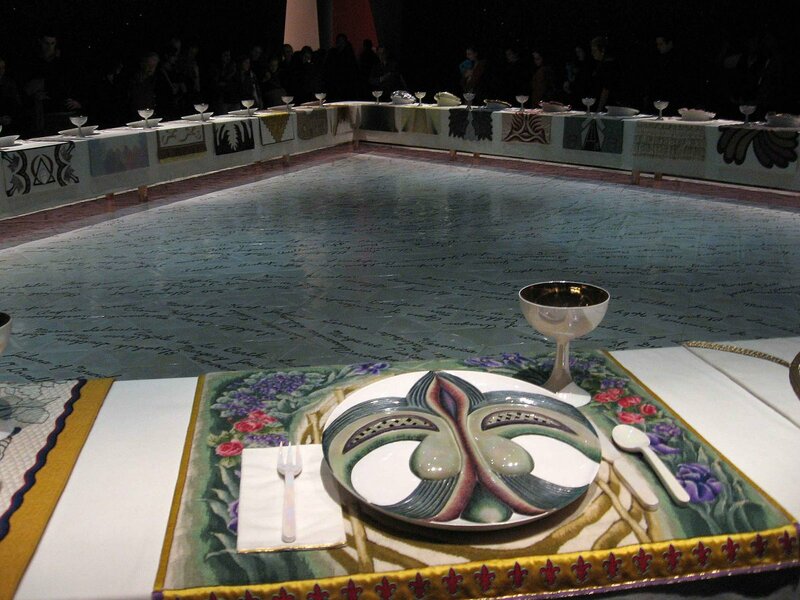 I had seen reproductions, which didn’t come close to the experience of walking intimately, around the triangular, banquet tables, lovingly and ceremoniously set with 39 place settings, tributing historical women from mythical goddesses, to Emily Dickenson. 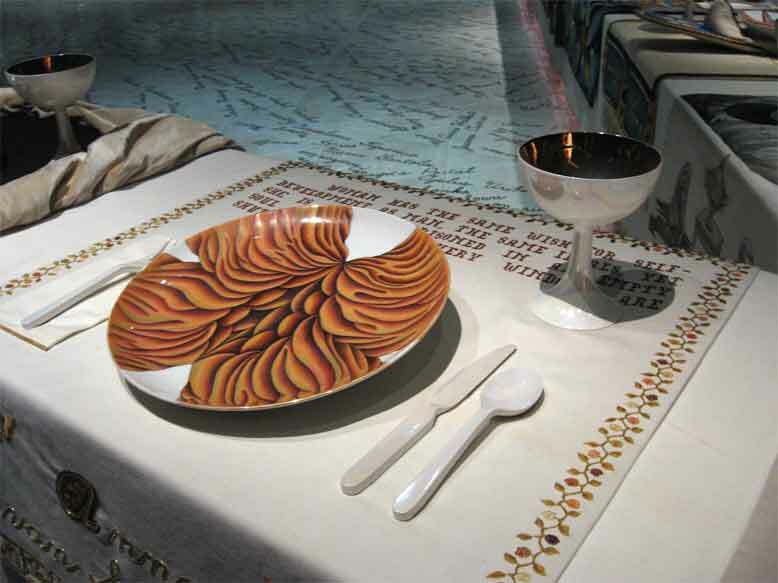 Intricately embroidered table linens sit beneath golden chalices and utensils, around unique, porcelain plates created for each recipient, with radiating forms representing female external sexual organs, not unlike a Georgia O’Keefe, flower painting, who was herself a guest at the table. The lighting is intimate and inviting, with the names of almost 1000 other women written on the tile floor. One of the outlying galleries will rotate an exhibition, relating to the women Chicago highlights in her project. Exiting this permanent installation you are once again confronted with the often sensatio nal images in “Global Feminisms.” There is an over abundance of photography and video, and simplistic, single dimension quick takes, but numerous gems are interspersed as well. A stand out performance work which I believe was “Untitled,” 2006-07, was by the appropriately, one named, Sissi (1977) from Italy. She hovered above the opening crowd, portraying a calm, basic, mindfulness, sitting on a golden branch, in a golden knotted or crocheted body suit like a mythical contemporary goddess of youthful female discernment. I liked Amy Cutler’s “Army of Me,” 2003 (US) and Annika von Hausssolff’s (Sweden), Melanie Manchot’s (Germany), Ingrid Mwangi’s (Kenya), Catherine Opie’s (US), Lisa Reihana’s (New Zealand), Anna Gaskell’s (US) and He Chengyao’s (China) photography. Although I admit to watching very little of the video works, I dug Sonia Khurana’s (India), Salla Tykka’s (Finland) and Boryana Rossa’s (Bulgaria) videos. I always respond to Kara Walker’s (US), Shahzia Sikander’s (Pakistan) and Wangechi Mutu’s (Kenya) paintings. Otherwise lot’s and lot’s of difficult pieces and walk by’s a plenty. It’s an uneven show that for me spoke about the youthfulness of the movement itself. I did find it curious that certain, well known New Yorker’s work, of my generation, like Janine Antoni’s was not present. I did though witness a heart felt conversation she was having with Amy Silman, from afar, like a mini movement of it’s own. Another performative moment in the evening was Martha Wilson and her dance partner tearing up the floor to the music in the Museum’s lobby. The cross-cultural worldwide “feminist solidarity/comparative studies model” coined by Chandra Talpade Mohanty, that the exhibition was aimed toward is a good place to examine where we are at. And thinking about solidarity brings me back to Ryszard Wasko. Although I missed him there (as well as Jane Fonda, Elizabeth A. Sackler and Gloria Steinem whom he was probably hanging with in the VIP room), his mentioning that he was attending, led to my spontaneously responding to the new feminist dialogue in the year of celebrating woman artists. 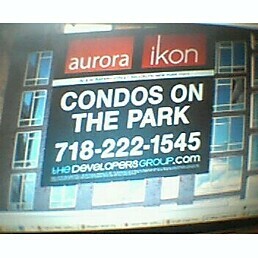 So thank you Wasko, Artist’s Organized Art for it’s sudden awakening and woman artists everywhere.